The Lake O'Hara watershed in the Canadian Rockies has been the site of several hydrological investigations. It has been instrumented to a degree uncommon for many alpine study watersheds. Air temperature, relative humidity, wind, precipitation, radiation, and snow depth are measured at two meteorological stations near Lake O'Hara and in the higher elevation Opabin Plateau. Water levels at Lake O'Hara, Opabin Lake, and several stream gauging stations are recorded using pressure transducers and validated against manual measurements. Stage–discharge rating curves were determined at gauging stations and used to calculate discharge from stream stage. The database includes additional data such as water chemistry (temperature, electrical conductivity, and stable isotope abundance) and snow survey (snow depth and density) for select years, as well as geospatial data (elevation and land cover). This dataset will be useful for the future study of alpine regions, where substantial and long-term hydrological datasets are scarce due to difficult field conditions. The dataset can be accessed at https://doi.org/10.20383/101.035. He, J. and Hayashi, M.: Lake O'Hara alpine hydrological observatory: hydrological and meteorological dataset, 2004–2017, Earth Syst. Sci. Data, 11, 111-117, https://doi.org/10.5194/essd-11-111-2019, 2019. Mountains are an important source of water for downstream regions (Viviroli et al., 2007). The hydrology of mountains in midlatitude and high-latitude regions is dominated by the storage of water in the form of snowpack and glaciers, which provide meltwater to headwater streams during the melt season (Barnett et al., 2005). 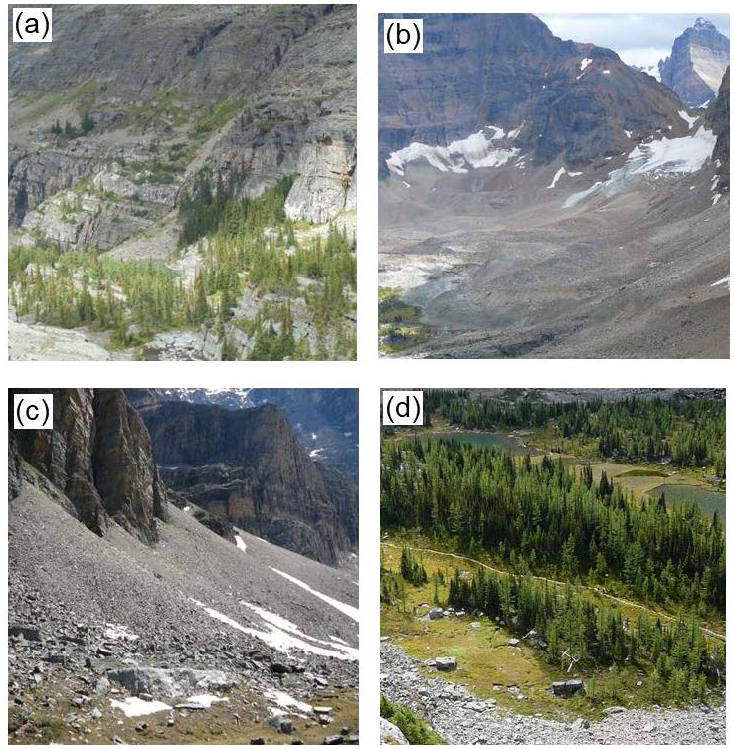 Climate warming can influence these processes through changes in the timing of snow accumulation and melt, the transition towards more rain and less snow, and depletion of glaciers and mountain permafrost (Bales et al., 2006). While it is straightforward to understand the effects of these changes on the timing and magnitude of spring freshet, their effects on the flow during low-flow periods is uncertain because groundwater can store and release meltwater, thereby buffering the effects of warming (Tague and Grant, 2009). 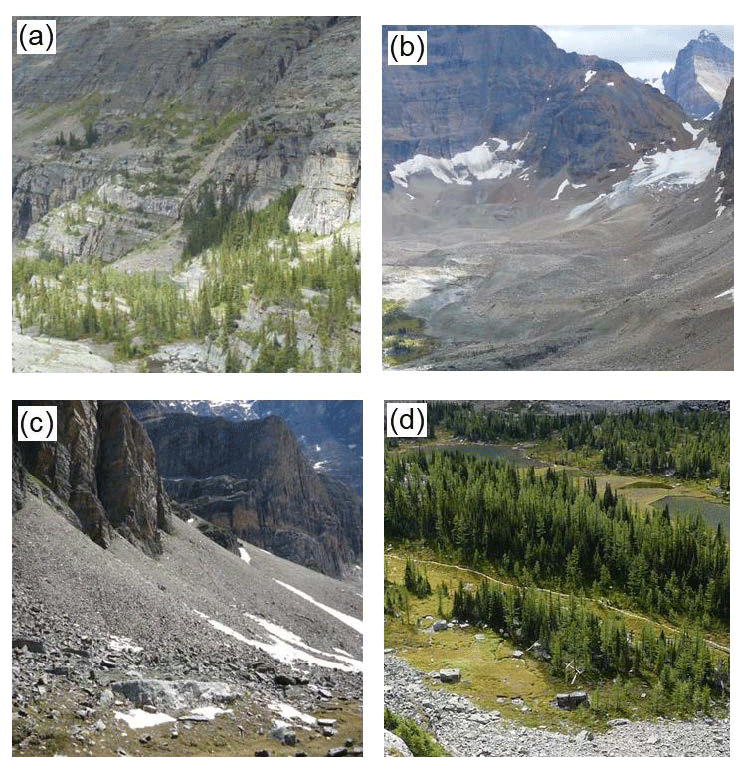 However, groundwater processes in alpine headwaters are not well understood due to the lack of long-term, field-based studies examining the interaction of surface water and groundwater in alpine zones. To address this gap in knowledge, an alpine hydrological observatory was established in the watershed of Lake O'Hara in the Canadian Rocky Mountains (see Site description below) in 2004. The observatory has supported a series of studies designed to identify important alpine aquifer units and characterize their hydrogeological functions (Roy and Hayashi, 2009; Langston et al., 2011; Muir et al., 2011; Hood and Hayashi, 2015). The observatory was integrated into a larger hydrological monitoring network under the Changing Cold Regions Network (CCRN) in 2013 (DeBeer et al., 2016). The unique dataset collected to date is available to the public through the CCRN data server. 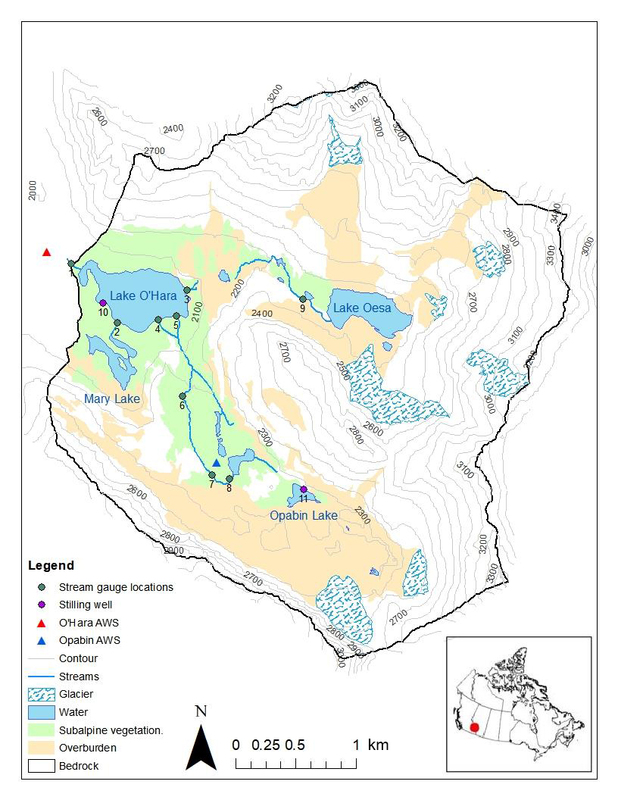 The objective of this paper is to describe the physiographical characteristics of the Lake O'Hara watershed, the history of the hydrological observatory, and the methods of data collection and processing for the potential users of the dataset. Figure 1Topographic map of the Lake O'Hara watershed indicating major land cover units and locations of installed equipment. Stream gauging stations are (1) O'Hara outlet, (2) Mary, (3) Oesa Falls, (4) West Opabin, (5) East Opabin, (6) Gorge, (7) Upper Opabin, (8) Hungabee, and (9) Lefroy Oesa. Stilling wells are (10) Lake O'Hara and (11) Opabin Lake. See Table S3 for station coordinates. Land cover delineation was based on 2006 aerial photography; current glacial extents are smaller than indicated on the map. The Lake O'Hara watershed in Yoho National Park has an area of 14 km2 and ranges in elevation from 1996 to 3440 m above sea level (m a.s.l.) (Fig. 1). 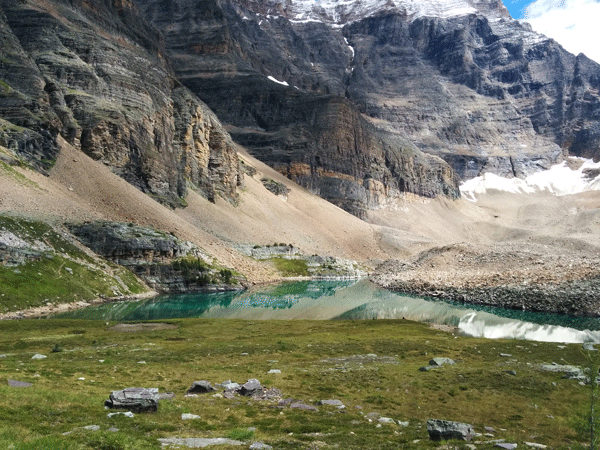 The site is accessible via an 11 km dirt road up to Lake O'Hara. Raw mean annual precipitation measured within the watershed at the Opabin automatic weather station (OPAWS) was 1021 mm during 2005–2017. 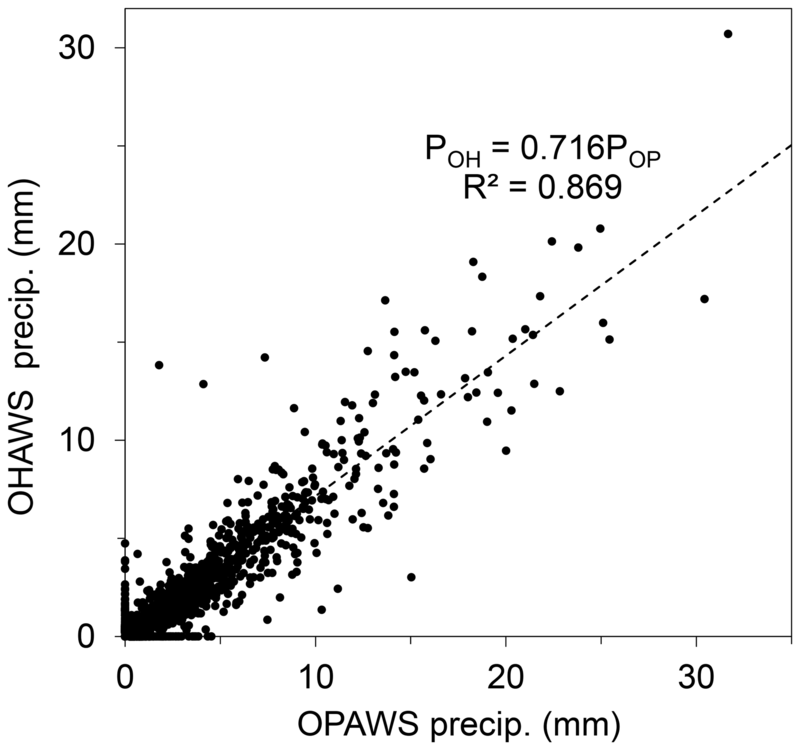 After adjustment for noise- and wind-induced undercatch (Kochendorfer et al., 2017), corrected annual precipitation at OPAWS was 1113 mm. Mean monthly air temperatures at OPAWS range from −9.0 (January) to 10.2 ∘C (July). Bedrock throughout the watershed consists mainly of quartzite of the Cambrian Gog Group. At higher elevations, carbonate of the Cathedral, Mt. Whyte, Stephen, and Eldon formations may be found capping mountains (Lickorish and Simony, 1995; Price et al., 1980). Bedrock is typically exposed at higher elevations as part of ridges which ring the watershed (Fig. 2a). Overburden deposits (e.g. talus and moraine) are present throughout the region, and are found in association with steeper bedrock slopes and small glaciers (Fig. 2b and c). These deposits play an important role in groundwater and surface water exchange throughout the watershed (Langston et al., 2011; Muir et al., 2011; Roy and Hayashi, 2009). For example, 70 %–80 % of flow in Upper Opabin Creek is provided from a large talus–moraine complex present in the Opabin Plateau (Hood and Hayashi, 2015). Surface water bodies such as Opabin Lake, Hungabee Lake, and the eponymous Lake O'Hara are found at lower elevations in the watershed. Previous study has indicated active interaction between lakes and groundwater (Roy and Hayashi, 2008). Groundwater input to Lake O'Hara was estimated to equal 35 %–74 % of surface outflow from the lake in 2005 (Hood et al., 2006). Alpine meadows (Fig. 2d) are generally found in close association with surface water bodies and are important sites for hydrological and ecological processes (McClymont et al., 2010). Figure 2Major hydrogeological response units in the Lake O'Hara watershed. (a) Exposed bedrock. (b) Proglacial moraine. (c) Talus. (d) Alpine meadow. Compared to other high-elevation lakes in the region, the Lake O'Hara hydrological observatory is easily accessible by a road, yet relatively undisturbed (road access is only allowed for a small number of authorized vehicles), making it ideal for the study of alpine hydrological processes. 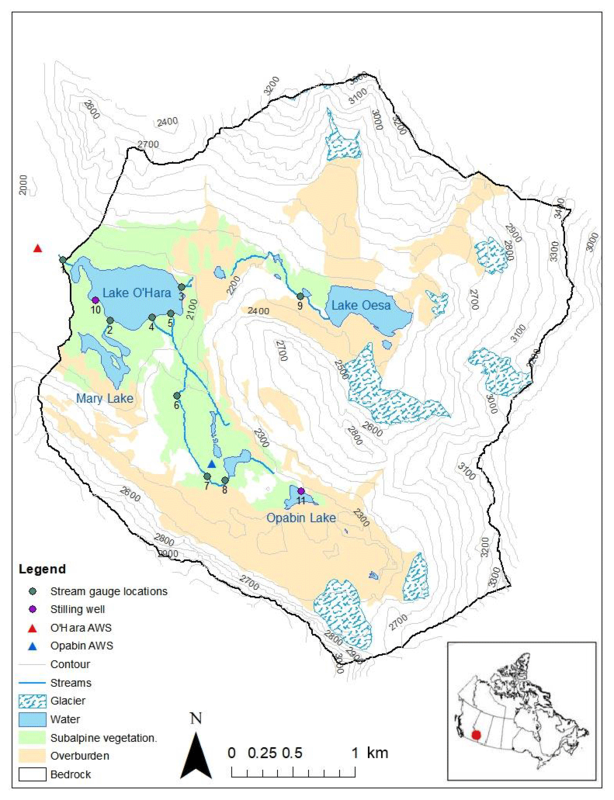 Monitoring at Lake O'Hara began in 2004 with the installation of OHAWS, OPAWS, and several stream gauging and water level monitoring stations (Fig. 1). Some change has been made to the number and locations of gauging stations. Since 2009, the Gorge gauging station has replaced the East and West Opabin stations for the measurement of discharge in the lower reaches of Opabin Creek. In Oesa Creek, measurements of discharge have been taken at the Oesa Falls (2005–2006, 2008 and 2014–2017) and Lefroy Oesa (2013–2014) gauging stations over different years. Water levels at Lake O'Hara and Opabin Lake have been measured continuously during the ice-free season since 2004. Additional equipment has been installed and removed as part of previous studies conducted within the watershed. Study-specific data include measurements from temporary sensors and stream gauging stations as well as extensive geophysical, geochemical, and snow survey data. The CCRN dataset only includes consistent measurements from permanent weather stations, lake stilling wells, and stream gauging stations (Fig. 1) over the years of 2004–2017. Some chemistry and snow survey measurements are also included for select years. Two permanent weather stations are present within the Lake O'Hara watershed (Fig. 1). OHAWS is located 500 m northwest of Lake O'Hara at an elevation of 2024 m a.s.l. OPAWS is located on the Opabin Plateau at 2230 m a.s.l. Both stations are equipped with air temperature and relative humidity sensors (Vaisala, HMP35) which are kept within solar radiation shields to mitigate the influence of direct sunlight on measurements. Wind speed and direction are measured with vane anemometers (RM Young, 05103). A four-component radiometer (Kipp & Zonen, CNR-1) measures incoming and outgoing fluxes of longwave and shortwave radiation at OPAWS. At OHAWS, a net radiometer (Kip & Zonen, NR-Lite) measures net radiation flux. Both stations have an ultrasonic snow depth sensor (Campbell Science, SR50) measuring the distance between the sensor and the ground or the snow level below. Temperature-compensated snow depth data are calculated from raw SR50 data and the sensor height. All aforementioned sensors are mounted on a tripod at both stations. 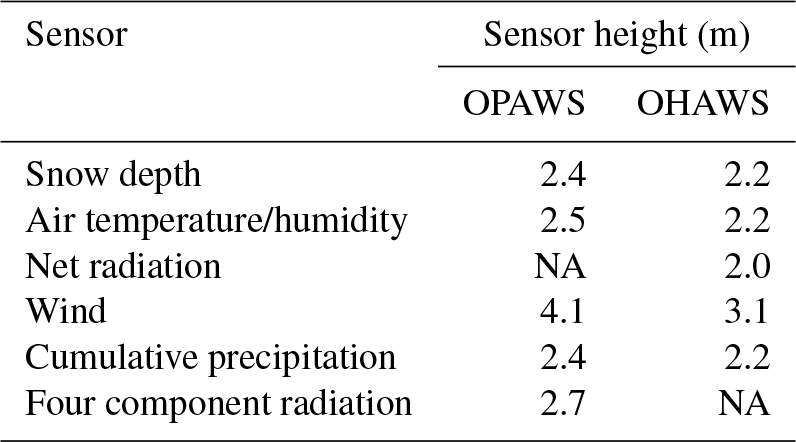 Recent sensor heights are listed in Table 1. Measurements are taken every minute, and average values are recorded at an interval of 60 and 30 min at OHAWS and OPAWS, respectively. Tipping bucket rain gauges (Hydrological Services, CS700) and weighing cumulative precipitation gauges (Geonor, T200B) are installed at both stations. Both types of precipitation gauge are suitable for measuring liquid precipitation; however, only the weighing gauge is capable of measuring solid precipitation. Tipping bucket gauges are placed on the ground, away from the main weather station tripod. Weighing gauges are mounted on a freestanding base and are equipped with an Alter wind shield to reduce wind-related snow undercatch. Precipitation and relative humidity sensors are calibrated yearly in order to ensure that they continue to accurately record measurements. However, relative humidity measurements fail to reach 100 % in several years, possibly due to the instrumental accuracy (2 % reported by the manufacturer) affecting the two-point calibration procedure using the saturated chemical solutions with known equilibrium humidity. In particular, the higher end of the data was substantially under-calibrated during 2011–2013, with maximum values reaching only 91 %. However, we have opted to keep the raw values in the database rather than making a subjective correction and introducing another degree of uncertainty. Table 1Current sensor height measurements at OHAWS and OPAWS. A more complete record of sensor height changes over the 2004–2017 monitoring period is available in Table S4 in the Supplement. NA denotes data that are not available. Meteorological measurements in the dataset are presented largely in raw form; some effort has been made to remove erroneous data due to sensor malfunction or maintenance in the raw dataset, but the data have largely been spared from other corrections. Precipitation data are available in both raw and corrected form. The corrected precipitation dataset has been adjusted for noise- and wind-induced undercatch (Kochendorfer et al., 2017). Undercatch-corrected precipitation was 8.6 % and 0.3 % higher than raw precipitation at OPAWs and OHAWS respectively. From 2011 to 2016, snow has been observed to accumulate at the top of the OHAWS weighing precipitation gauge and persist over the span of several weeks in the wintertime. This accumulation effectively blocks the opening of the gauge (i.e. snow capping), resulting in a period of time during which no precipitation is registered. We attempt to approximate this missing data at OHAWS from measurements recorded at OPAWS in the corrected dataset. Comparison of noise and undercatch-corrected daily precipitation between the two weather stations indicates a linear correlation (Fig. 3). Using the trend line from Fig. 3, precipitation at OHAWS was approximated and used to fill in gaps during periods of snow capping. Table S1 in the Supplement lists the date ranges for which precipitation was approximated, and total approximated precipitation. Gauging stations are located at the outlets of Lake O'Hara and Hungabee Lake and along reaches of several creeks (Fig. 1). To establish the discharge–stage rating curve, biweekly manual discharge measurements are taken at each station over field seasons which typically last from early June to late September. Average stream flow velocity and water depth are measured in segments 10 or 25 cm wide across the width of a stream with a propeller flow meter (Global Water, FP101), and discharge is calculated by the area–velocity method (Dingman, 2002, p. 609). Figure 3Relationship between daily winter precipitation at OHAWS (POH) and OPAWS (POP). Daily precipitation was corrected for instrument noise- and wind-induced undercatch. Plotted daily precipitation was sampled from the entire monitoring period (2004–2017) for days between 1 December and 30 April, for which both OPAWS and OHAWS were recording and correctly functioning the entire day. R2 is the coefficient of determination. Pressure transducers (In-Situ, Minitroll; In-Situ, LevelTroll; Solinst, Levelogger) are installed in stilling wells at each stream gauging station and automatically record water level and temperature in 15 min intervals. To verify the transducer data, water levels are measured manually from a reference (staff gauge or stilling well) with discharge measurements. A power function is used to define the rating curve, which is calibrated each year to find a coefficient and exponent which minimize error between measured and computed discharge. With the rating curve, a near-continuous record of stream discharge can be calculated from the transducer data. Hourly and half-hourly averaged discharge is included within the dataset. Discharge is only measured from spring (typically early June) to fall (typically late September) of each year due to winter freeze-up in stream channels. Pressure transducers housed in stilling wells are used at water level monitoring stations in Lake O'Hara and Opabin Lake (Fig. 1). Transducer water levels are compared with manual measurements of water level taken during field visits. At Lake O'Hara, manual measurements are taken as the distance from the top of the stilling well casing to the lake water level. At Opabin Lake, manual measurements are taken as the distance from a rock bolt (securing the stilling well) to the lake water level. Within the dataset, both raw water level (depth of water above the transducer) and corrected water level are included. Corrected water level is normalized against the benchmark and is calculated as the distance between the benchmark and the water level. Therefore, the corrected water level increases when the lake water level (and raw water level) drops. The same is true in reverse. Negative values of corrected water level indicate periods when the lake water level is above the datum. Corrected water levels are not available in several years due to inconsistent manual measurement and recording of lake water levels (Table S2). Water levels are only available from spring to fall of each year due to freeze-up. Snow depth and density are measured annually in mid-April to capture the amount of peak accumulation. The extent of these snow surveys has varied over the years, from a handful of transects nearby OHAWS and OPAWS to hundreds of measurements spanning the entire Opabin Plateau. Snow surveys are typically conducted by laying a measurement chain along the survey transect and measuring snow depth at a fixed interval with a probe or ruler. Snow density measurements are taken along the survey transect or from snow pits (see Hood and Hayashi, 2015 for details). Handheld Global Positioning System devices are used to locate depth and density measurement points. Snow survey data from 2006 to 2017 are included within the dataset. 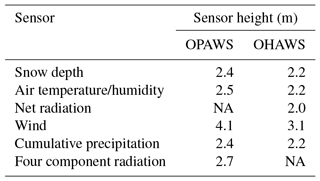 Before 2012, measurements near OHAWS were made inconsistently, but in more recent years, data from both OPAWS and OHAWS have been available (Table S2 in the Supplement). Stream water and rain samples are collected during biweekly site visits. Stream water is sampled at most gauging stations (Fig. 1). During sampling, water is filtered in the field using 0.45 µm disposable filters and stored in pre-rinsed polyethylene bottles. Electrical conductivity and temperature of stream water are measured during collection with handheld meters (VWR, 2052-B; Omega Engineering, HH-25TC). Rain samples are collected from samplers deployed near both weather stations and Opabin Lake. Depth-integrated snow samples were collected from snow pits during snow survey campaigns in 2015 and 2016, and subsamples of entire meltwater were kept for isotope analysis. All water samples are stored at 4 ∘C until analysis. Oxygen-18 and deuterium isotope abundances are measured in all collected samples using an off-axis integrated-cavity spectrometer (Los Gatos Research, DLT-100). This dataset includes chemical and stable isotope data collected from 2004 to 2008, 2013, and from 2015 to 2016. The dataset includes a 2 m resolution digital elevation model (DEM) of the Lake O'Hara region derived from the light detecting and ranging (lidar) data (Hopkinson et al., 2009). Some difference in elevation has been found between the lidar DEM provided and older, lower resolution topographic maps of the region, possibly resulting from inconsistency in the elevation datum used during the lidar survey. However, the lidar DEM still represents topography within the watershed accurately. Also included are several ArcMap (ESRI, 2014) shapefiles which classify land cover throughout the watershed (Fig. 1). Land cover was classified manually from an aerial photo taken in August 2006. 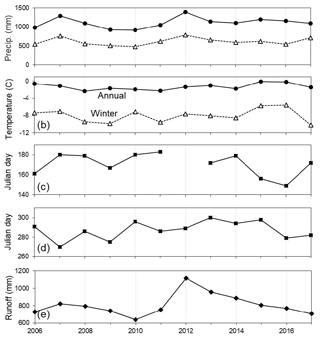 Figure 4(a) Annual total and winter (14 October–30 April) precipitation at OPAWS. (b) Mean annual and winter (14 October–30 April) air temperature at OPAWS. (c) First day of complete melt at OPAWS. Data are missing in 2012 due to sensor malfunction. (d) First day of snow accumulation at OPAWS. (e) June–September total runoff at the Lake O'Hara outlet. 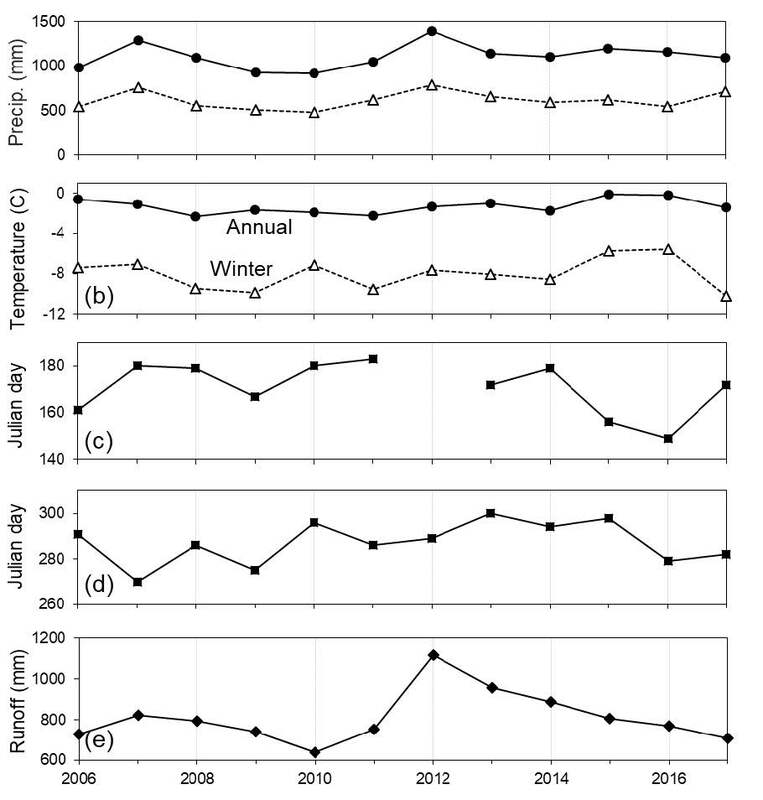 Figure 4 show the annual time series of hydro-meteorological parameters indicating the inter-annual variability of hydrological fluxes during hydrological years (HYs) 2006–2017. Note that the HYs in these plots are defined as 1 October–30 September; e.g., HY2006 starts on 1 October 2005. Winter is defined as 14 October–30 April because the average start date of snow accumulation is 14 October, and the accumulation normally peaks in late April. Annual total precipitation at Opabin AWS ranged between 920 and 1394 mm with a mean of 1113 mm, while winter precipitation ranged between 475 and 785 mm with a mean of 612 mm (Fig. 4a). The ratio of winter to total precipitation ranged between 0.46 and 0.65. Annual mean and winter mean air temperature ranged from −2.4 to −0.1 ∘C and from −8.9 to −5.4 ∘C, respectively (Fig. 4b). There was no noticeable trend in any of these parameters. The timing of snow accumulation and melt are believed to respond sensitively to the climate warming (e.g. Barnett et al., 2005). We define the first day of accumulation at Opabin AWS as the day when snowpack starts to persist continuously, and the first day of complete melt as the day when the snow depth sensor indicates no snow. These dates varied widely with the first day of melt from 29 May to 3 July (Fig. 4c) and the first day of accumulation from 28 September to 26 October (Fig. 4b), but there was no noticeable trend. The total discharge (i.e. 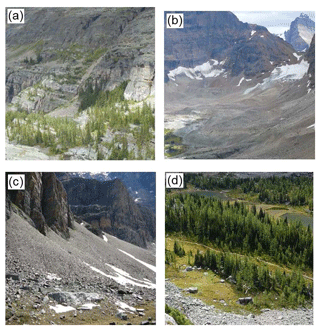 watershed runoff) during June–September measured at the Lake O'Hara outlet had large variability (Fig. 4e) and was positively correlated with total annual precipitation (r, correlation coefficient =0.78; p, significance level =0.003) and winter precipitation (r=0.65, p=0.02), as expected. Previous studies in the region have shown that late-summer flow in alpine streams is predominantly sourced by groundwater (e.g. Hood and Hayashi, 2015; Harrington et al., 2018). However, discharge in September (not plotted) was not correlated to either total annual precipitation (r=0.01, p=0.75) or June–August precipitation (r=0.003, p=0.86), suggesting that the groundwater discharge rate may be controlled by factors other than precipitation, such as the storage capacity or transmissivity of aquifers. The Lake O'Hara dataset is available from the Federated Research Data Repository (FRDR), and can be accessed from the FRDR at https://doi.org/10.20383/101.035 (He and Hayashi, 2018). 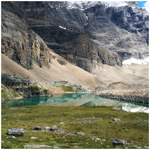 The data from the Lake O'Hara hydrological observatory have contributed significantly to our understanding of groundwater processes in alpine environments. The long-term dataset can be used to examine the inter-annual variability of hydrological fluxes and the timing of snow accumulation and melt, and their long-term trends. The unique dataset will be valuable to alpine hydrological research communities for various purposes such as inter-site comparison of hydrological processes or hydrological model testing. The supplement related to this article is available online at: https://doi.org/10.5194/essd-11-111-2019-supplement. Both authors were involved with data collection, data processing and the writing of the paper. This article is part of the special issue “Water, ecosystem, cryosphere, and climate data from the interior of Western Canada and other cold regions”. It is not associated with a conference. The field program at Lake O'Hara was assisted by numerous field assistants, who are too many to name. We especially thank the graduate students and post-doctoral fellows who conducted hydrological research projects: Jaime Hood, James Roy, Danika Muir, Greg Langston, and Andrius Paznekas. We also thank field technicians who took responsibility for data collection and quality control: Mike Toews, Jacqueline Schmidt, Nathan Green, Jackie Randall, Kate Forbes, Krystal Chin, Shelby Snow, and Brandon Hill. Chris Hopkinson and the Canadian Consortium for Lidar Environmental Application Research provided lidar data for the DEM, Parks Canada and Lake O'Hara Lodge provided logistical support, and Branko Zdravkovic and Amber Peterson assisted with data transfer and archiving. The program has been funded by Natural Sciences and Engineering Research Council (Discovery Grant, CCRN), the Biogeoscience Institute of the University of Calgary, Alberta Ingenuity Centre for Water Research, the Canadian Foundation for Climate and Atmospheric Sciences (IP3 Network), the Canada Foundation for Innovation, the Canada Research Chair program, and Environment Canada. Constructive comments by Ignacio López-Moreno and an anonymous reviewer contributed to improved clarity of the paper. Bales, R. C., Molotch, N. P., Painter, T. H., Dettinger, M. D., Rice, R., and Dozier, J.: Mountain hydrology of the western United States, Water Resour. Res., 42, 08432, https://doi.org/10.1029/2005WR004387, 2006. 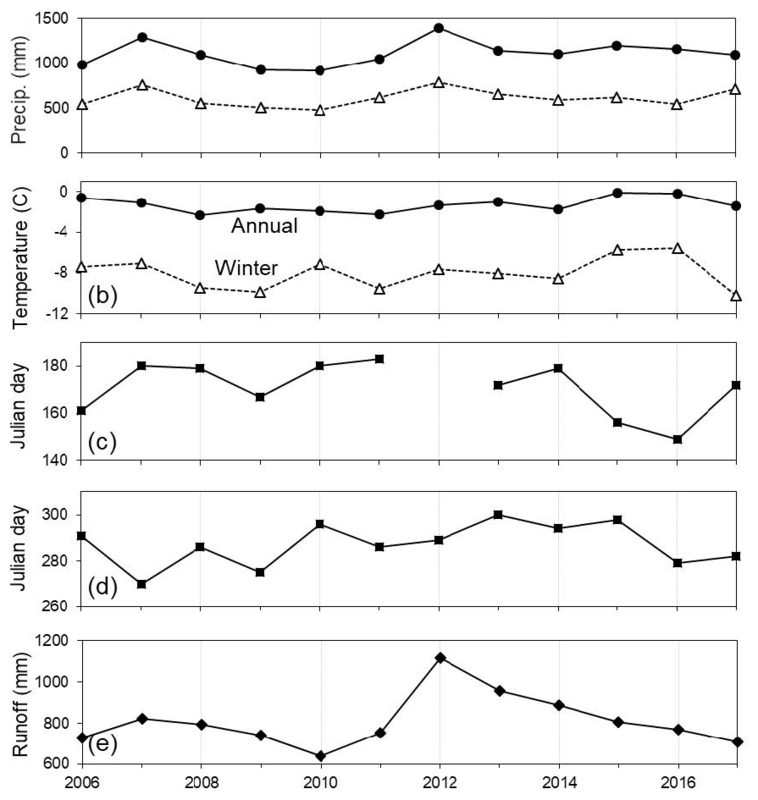 DeBeer, C. M., Wheater, H. S., Carey, S. K., and Chun, K. P.: Recent climatic, cryospheric, and hydrological changes over the interior of western Canada: a review and synthesis, Hydrol. Earth Syst. Sci., 20, 1573–1598, https://doi.org/10.5194/hess-20-1573-2016, 2016. Dingman, S. L.: Physical Hydrology, Prentice Hall Inc., Upper Saddle River, New Jersey, USA, 2002. ESRI: ArcMap, 10.3 edn., ArcGIS, Esri, Environmental Systems Research Institute, Redlands, CA, USA, 2014. Harrington, J. S., Mozil, A., Hayashi, M., and Bentley, L. R.: Groundwater flow and storage processes in an inactive rock glacier, Hydrol. Process., 32, 3070–3088, 2018. 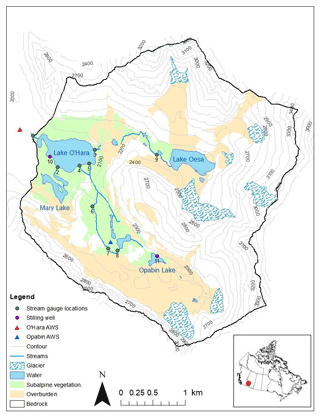 He, J. and Hayashi, M.: Hydrological and meteorological dataset from the Lake O'Hara alpine hydrological observatory, 2004–2017, Federated Research Data Repository, https://doi.org/10.20383/101.035, 2018. Hood, J. L. and Hayashi, M.: Characterization of snowmelt flux and groundwater storage in an alpine headwater basin, J. Hydrol., 521, 482–497, https://doi.org/10.1016/j.jhydrol.2014.12.041, 2015. Hood, J. L., Roy, J. W., and Hayashi, M.: Importance of groundwater in the water balance of an alpine headwater lake, Geophys. Res. Lett., 33, L13405, https://doi.org/10.1029/2006GL026611, 2006. Hopkinson, C., Hayashi, M., and Peddle, D.: Comparing alpine watershed attributes from LiDAR, photogrammetric, and Contour-based digital elevation models, Hydrol. Process., 23, 451–463, 2009. Langston, G., Bentley, L. R., Hayashi, M., McClymont, A., and Pidlisecky, A.: Internal structure and hydrological functions of an alpine proglacial moraine, Hydrol. Process., 25, 2967–2982, https://doi.org/10.1002/hyp.8144, 2011. Lickorish, W. H. and Simony P. S.: Evidence for late rifting of the Cordilleran margin outlined by stratigraphic division of the Lower Cambrian Gog Group, Rocky Mountain Main Ranges, British Columbia and Alberta, Can. J. Earth Sci., 32, 860–874, 1995. McClymont, A. F., Hayashi, M., Bentley, L. R., Muir, D., and Ernst, E.: Groundwater flow and storage within an alpine meadow-talus complex, Hydrol. Earth Syst. Sci., 14, 859–872, https://doi.org/10.5194/hess-14-859-2010, 2010. Muir, D. L., Hayashi, M., and McClymont, A. F.: Hydrological storage and transmission characteristics of an alpine talus, Hydrol. Process., 25, 2954–2966, https://doi.org/10.1002/hyp.8060, 2011. Price, R. A., Cook, D. G., Aitken, J. D., and Mountjoy, E. W.: Geology, Lake Louise, Alberta and British Columbia, Geol. Surv. of Can., Ottawa, Ontario, Canada, 1980. Roy, J. W. and Hayashi, M.: Groundwater exchange with two small alpine lakes in the Canadian Rockies, Hydrol. Process., 22, 2838–2846, https://doi.org/10.1002/hyp.6995, 2008. Roy, J. W. and Hayashi, M.: Multiple, distinct groundwater flow systems of a single moraine-talus feature in an alpine watershed, J. Hydrol., 373, 139–150, https://doi.org/10.1016/j.jhydrol.2009.04.018, 2009. Tague, C. and Grant, G. E.: Groundwater dynamics mediate low-flow response to global warming in snow-dominated alpine regions, Water Resour. Res., 45, 1–12, https://doi.org/10.1029/2008WR007179, 2009. Viviroli, D., Dürr, H. H., Messerli, B., Meybeck, M., and Weingartner, R.: Mountains of the world, water towers for humanity: Typology, mapping, and global significance, Water Resour. Res., 43, 1–13, https://doi.org/10.1029/2006WR005653, 2007.